Europe should be waking up and smelling the coffee. TOC Hostels in Barcelona undoubtedly has the best budget boutique accommodation in this continent by a long margin. That’s a fact. And I’m going to tell you why. TOC Hostels claims to offer you an unforgettable new hostel experience where you will feel like you are in a unique hostel with marvellous interior design. Whether you want a private room or a dorm bed, you’ll find the perfect accommodation suited for your needs and budget. Bot only that, they recommend you to relax, make friends and have some drinks or tapas on their popular terrace that also includes a swimming pool. So with that in mind, I decided to book with TOC Hostels in Barcelona for three nights in early February 2015 for my exploration of this Mediterranean city on the Catalan coast. See More: Would you go to Barcelona in Winter? Arriving on a sunny Thursday morning at the airport in Barcelona, I was picked up by Rainbow Barcelona Tours who took me to the Exiample district where the hostel was based. After being greeted by smiling staff who told me to fill out further information, I was then shown to my room and became officially checked in. Let’s see what TOC Hostels are made of. I was officially checked in to a 4 bed suite which David of Two Bad Tourists and I could take advantage of. There are 11 of these rooms out of the 52 that TOC Hostels has. 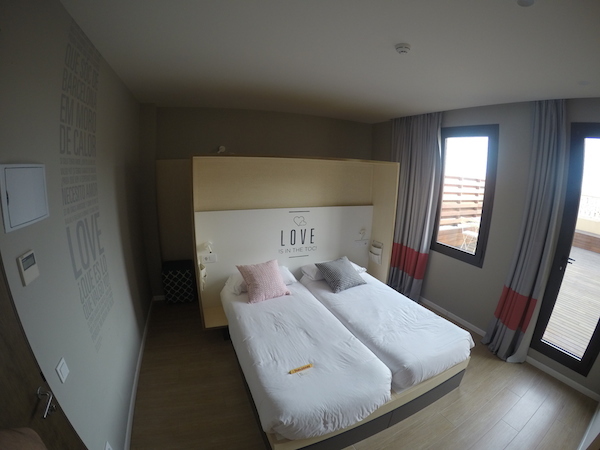 For all four people, the price for this room is €161 (excluding breakfast). What features could we see? So how did I sleep? I slept rather well on all three nights. It was very quiet, the temperature was just right thanks to having my own air conditioning and the beds were ultra comfy with cool white sheets. The room was rather spacious and I just absolutely loved the minimalist design that was a pleasure to see when waking up in the morning. What’s more, the room stayed fresh and clean all day thanks to the cleaning staff who came every day and we often returned to find out beds made up. 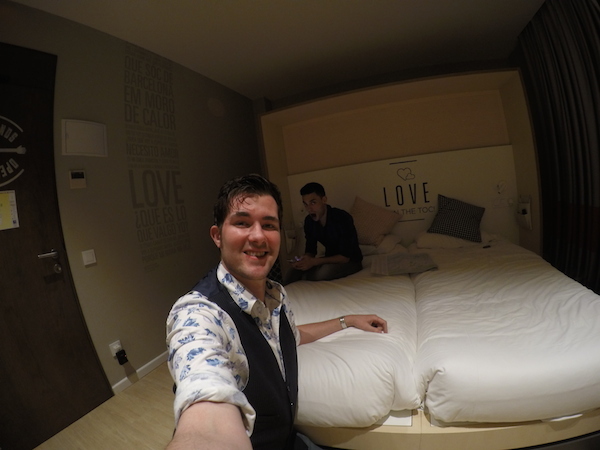 Overall, a perfect room and hostel experience! With the room, we had a separate toilet and a separate shower. The sink was also part of the main room. Let’s talk about these three. 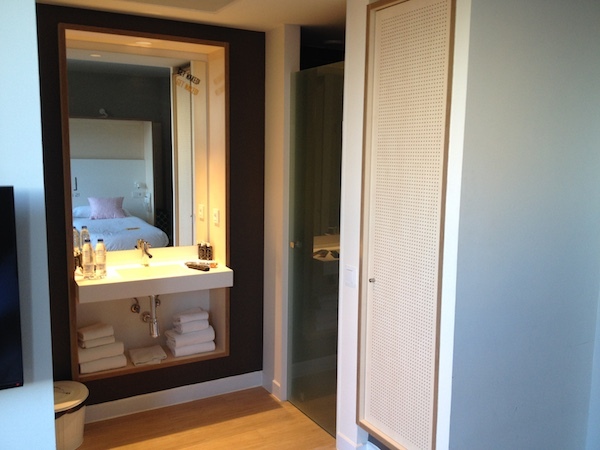 Separate toilet – This ensuite toilet was designed very well and I liked that you could have the chance to use this while another was in the shower. So, no queues there! There was regular toilet paper supply and sometimes I would linger here as it felt like a zen space! Separated by an opaque glass door from the room, you do feel some sense of privacy. However, sounds can be creeped out and unless you know your friends and family really well, it was probably best to cough at certain times! Shower – Like the toilet, the shower was separated by an opaque door. Designed well, you could enjoy the shower experience as a large shower head made sure for a jet stream of water to soothingly cover your body. Sink – On one end of the room was the sink that was open to all. Ideally, it wouldn’t have been a ‘luxury’ to have it within the room but in TOC Hostels, it worked. I think it’s due to a massive mirror that appeared over the sink so you could style yourself with ease without having to move away from your wardrobe. Body wash, disposable toothbrushes, toothpaste and water was readily available to us throughout our stay. I know I’m missing the shower already! Overall I found service at TOC Hostels to be satisfactory. Reception – The staff at reception were very knowledgable about Barcelona and could often be on hand with a smile to help plan your day. Check in was very smooth and any requests were responded to with ease. Breakfast service – There was a dedicated member of staff to help with your breakfast. He would often talk to us making us feel at home. 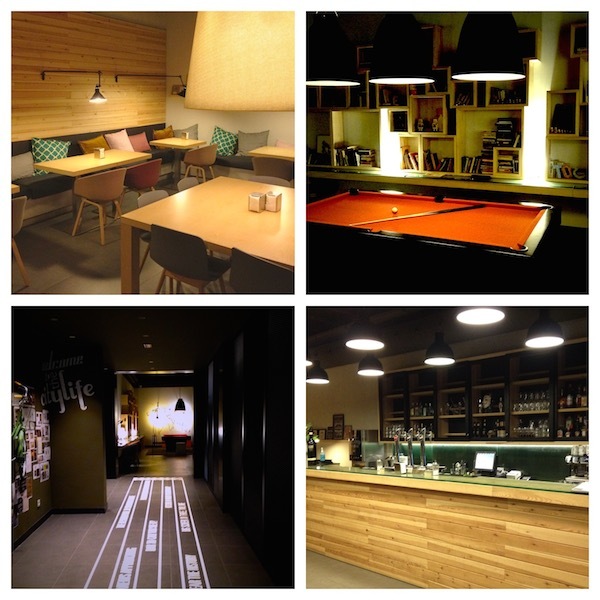 Bar Service – With a beautiful bar within the communal area within TOC Hostels, I was pleased I would be given a chance to relax with a glass of wine or a litre of beer. However, the bar opening times were confusing as sometimes I would come down to find it was closed in the evening or the staff missing. However, when the bar was open, I sampled their range of wine which was delicious. I was told that as it was off-peak, the bar wouldn’t be open sometimes. Entertainment Service – There was someone at the entrance who tried to make us come to the beach to have a bit of a party. We may have joined if it wasn’t for the busy schedule we had but he was friendly. 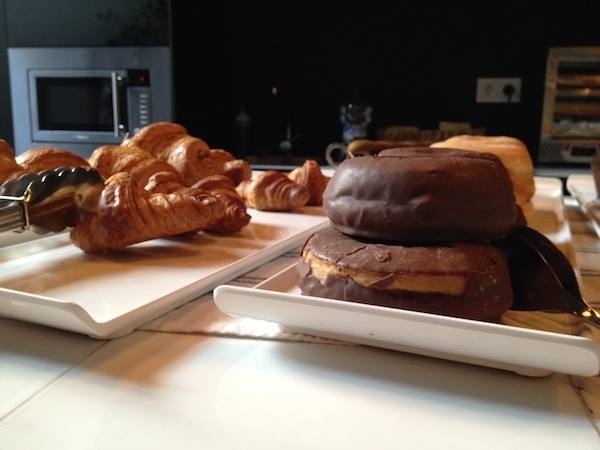 There was a continental breakfast spread available to guests who has booked for it. Upon check-in, you are given your breakfast passes, which you can to give to the breakfast staff upon arrival in the morning. Breakfast consisted of cold meats, a range of cheeses, donuts, chocolate, breads, muffins, cereal, coffee, orange juice and more. It was all rather good and filling. Including the bar area, the open plan communal area included a lounge area where you could chill on beanbags and very soft chairs to laze around on. A projector screen covered a large wall showing the latest music videos and perhaps sport. A main gripe for me was that sometimes the sound from the TV was rather loud and I couldn’t hear the other guests very well. There was also a swish pool table that you could take advantage of as well. Not only there’s an indoor area, there are also outdoor communal areas too. This included a beautiful and quiet terrace where you could sunbathe, chat or relax in. Not only that, there is also a swimming pool! Unfortunately, it was rather a cool February when I was there so the pool was closed. I’m glad to say that the Wi-Fi was very strong, fast and accessible in all areas of the hostel. All you needed to do was get login details from reception and you’re sorted! Laundry Room – great for those who are inter-railing through Europe and need a place to wash their clothes. Office – Need to get your work done outside your room? There’s an office you can use. 24hr Market – Reception will sell non-alcoholic drinks and sweets. I can’t rave enough about the convenient location of TOC Hostels in Barcelona. Set in the Exiample district, you are very close to public transport including buses, metros and taxis. You are also within walking distance to the Gothic Quarter of Barcelona and the many famous parks around. Nightlife is also very close by thanks to the Arena bars and small quirky bars too. It was also a great vantage point to start your tour with Rainbow Barcelona Tours. 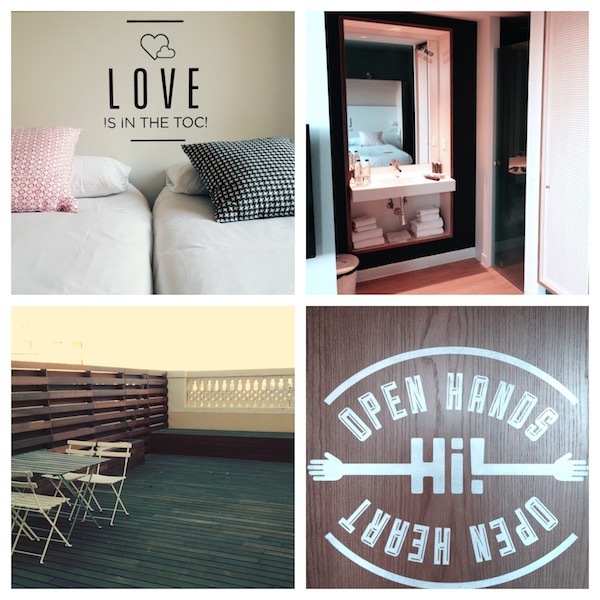 Did I feel I was in an unforgettable new hostel experience in TOC Hostels? I certainly felt like this thanks to the contemporary and modern designs in this hostel. My favourite thing about it was my hostel room where I absolutely enjoyed staying in. The location was second followed swiftly by the bathroom. However, I do feel like I need to return in the summer to experience the social aspect of the hostel as in the middle of winter when I visited, it certainly felt off-peak with limited services available. Overall, my stay in TOC Hostels in winter has to be 4 out of 5 stars. If you’re looking for luxury accommodation at budget prices for that unique new hostel experience in Barcelona, give TOC hostels a try. You won’t be disappointed! *Thanks to TOC Hostels for giving me a three night stay in their Barcelona Hostel. However, all opinions are my own. Oooh this looks gorgeous! Added it to the reviews by bloggers directory 🙂 Hope you enjoyed Barca! Barcelona was absolutely amazing and I can’t wait to go back!